One of the first ways students will learn to manage money in today's society is through the use of a debit or credit card. There are many students who don't know how to order things online because they are unfamiliar with the format in which different companies request information. 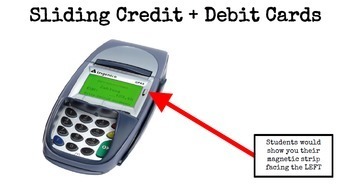 With this download, students will have the chance to practice learning how to slide debit/credit cards while looking at various card machines. Some machines require students to slide the magnetic strip to the right, while others might want it to the left. They will look at pictures on each machine and then will show you which side their card strip would slide (template provided). This is a great kinesthetic and visual activity for students to practice a very important real world skill! 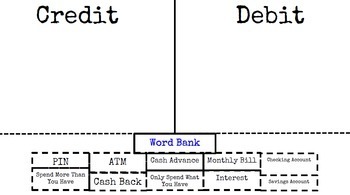 Students will also do a key word sort for credit and debit cards, as well as answer questions about which card was used in real world scenarios. 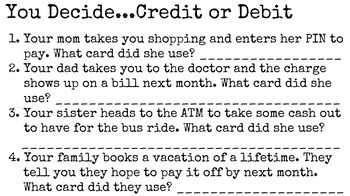 - 12 comprehension questions where students decide whether a credit or debit card was used. Interested in Other Credit and Debit Card Downloads? Credit Cards, Unit 1: Click Here! Credit Cards, Unit 2: Click Here! 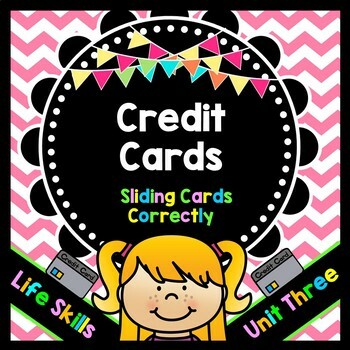 Credit Cards, Unit 3 - Click Here! ** Want them ALL? **: Click Here! Interested in a Bulletin Board That Teaches About Reading Expiration Dates?